Mixed Feelings Dazed Thoughts: Of Jamuns..
My first post from Sitapur. Three months have whirled by and I have never quite found anything as fascinating to merit a post. The days follow a mundane pattern and often being occupied at office, I found 'fruit lunch' as a solution to menu related inquiries. As rains draw in, watermelons begin to lose their colour and sweetness and I requested for replacement with whatever fruit was locally available in abundance (in addition to our super abundant mangoes of course!). To my astonishment (and immense nostalgia), I was presented with a plateful of Jamuns today. In the past decade of serving in Uttar Pradesh, of all the fruits that grow well in this part of the country, I never imagined Jamuns could be one. To us, Jamuns have always been small black-blue-violet berries which dot the pathways of parks and public gardens and leave amethyst streaks wherever they fall. It is a common sight to find folks gathering the edible ones for consumption in such parks and streets. 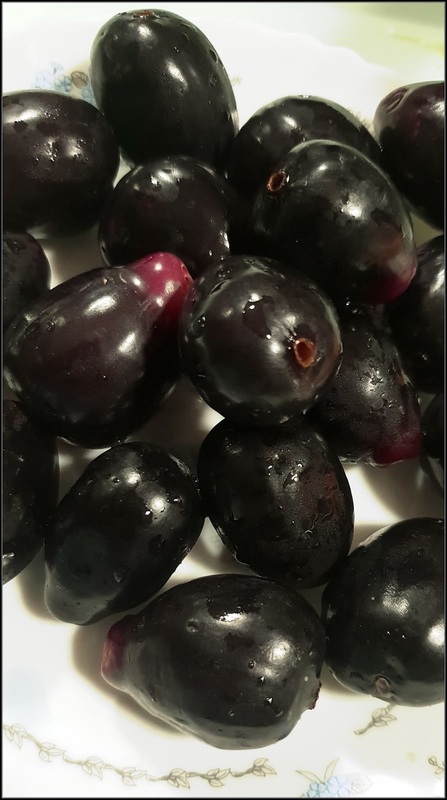 Growing up in Delhi, I only remember buying Jamuns in small newspaper pouches (which never contained say more than 10) and thought like most berries (falsa and shahtoot) these must be rare and not meant to be eaten heartily. And yet when I was brought that plate of Jamuns, it suddenly took me almost three decades back. I clearly remember the day it had rained heavily all night, there was a storm and there was no power in our part of the city. Therefore, as soon as our school van deposited us (the very few who had braved the weather to attend the school) at the gate of our small school building, to our utmost glee, a huge branch of the lone Jamun tree in the school courtyard had fallen. With no electricity to keep us indoors and the absence of sun outside, we were given an impromptu picnic of sorts. I remember filling the pockets of my rust colored skirt and everybody else doing the same. But what I remember most is my sister suggesting we empty our 'Milton' water bottles and fill them with Jamun too (and we did that eventually only to present our Mother with squashed Jamuns upon arrival and also the problem to clean that bottle somehow!). From that day in late 80s to the day I saw these Jamuns today, I have no other memory of a Jamun feast. In reality, I do not even remember eating or buying Jamuns eversince I am on my own. And yet as I write this post, it occurs to me now why my 'Nani' (grandmother) always referred to the color purple as 'jamuniya'. While I believe purple is my favourite colour, the connection never occurred to me before. Nani is no longer around and others in the family refer to color purple as 'baingani' (like a brinjal). Like many memories which evaporate or remain tucked in some unknown corner, this was one. For once I am contented and grateful for the surprises life offers us. For once, I am astonished how stories of life resurface unbeknownst. For once, my plate is full and I relish what I have!